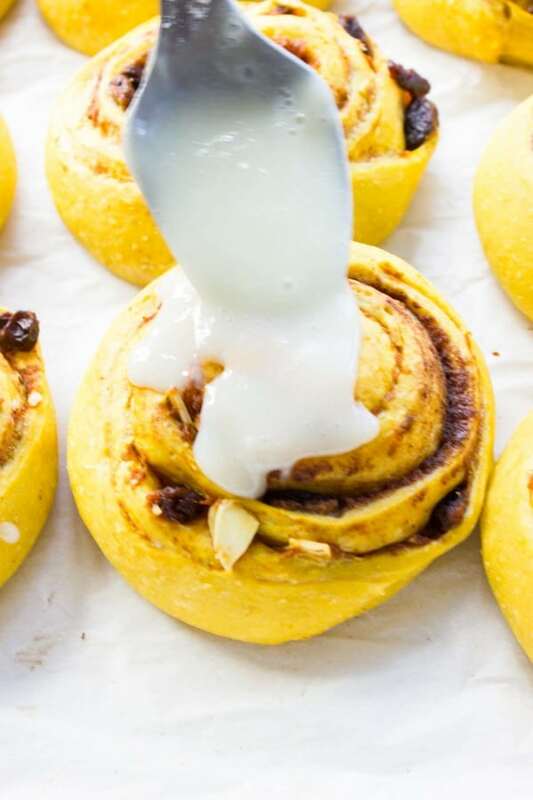 These Pumpkin Cinnamon Rolls are a fall-inspired, spiced up version of classic cinnamon rolls with pumpkin puree both in the pillowy yeasted dough AND the filling. Topped with vanilla cream cheese icing and a caramel drizzle, these rolls make a perfect treat for cozy autumn mornings. These Pumpkin Cinnamon Rolls are super tender, super fluffy and stay moist for days. 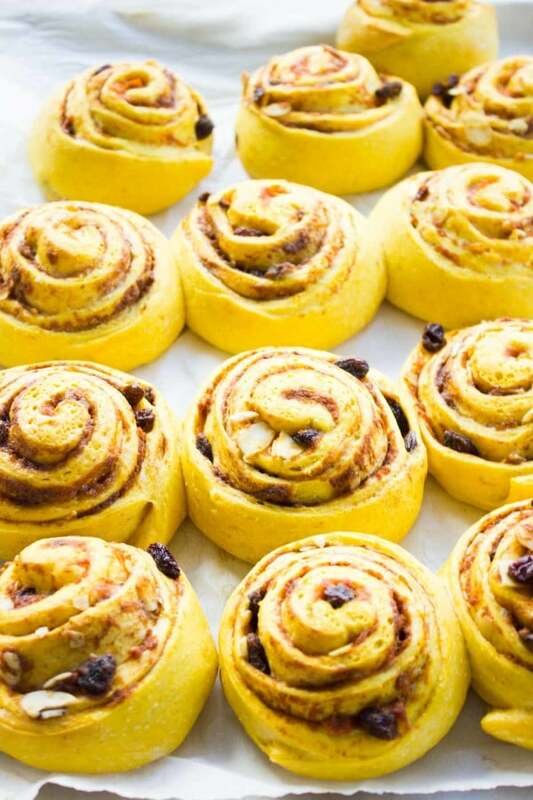 Picture a pillowy soft dough filled with pumpkin puree, raisins, and almonds. 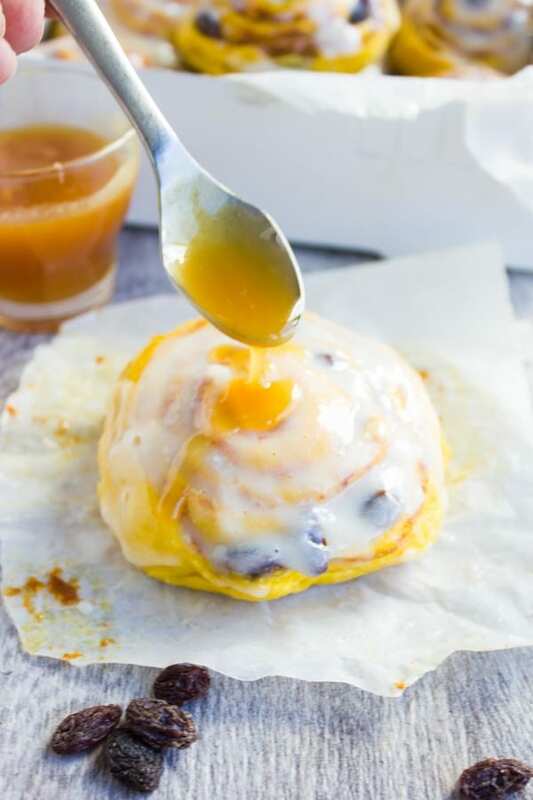 Once baked, these soft Pumpkin Cinnamon Rolls are frosted with a vanilla cream cheese icing and drizzled with a smooth caramel sauce. It’s the ultimate cinnamon roll for your Thanksgiving table! It’s countdown for Thanksgiving and this year I’m not hosting. I’m a first-time guest and as I don’t want to show up empty handed I’m making either this quinoa Autumn harvest salad or this blackberry pecan roast veggie power salad. 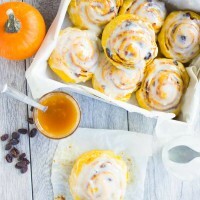 And for sure I’m bringing these amazing Pumpkin Cinnamon Rolls! 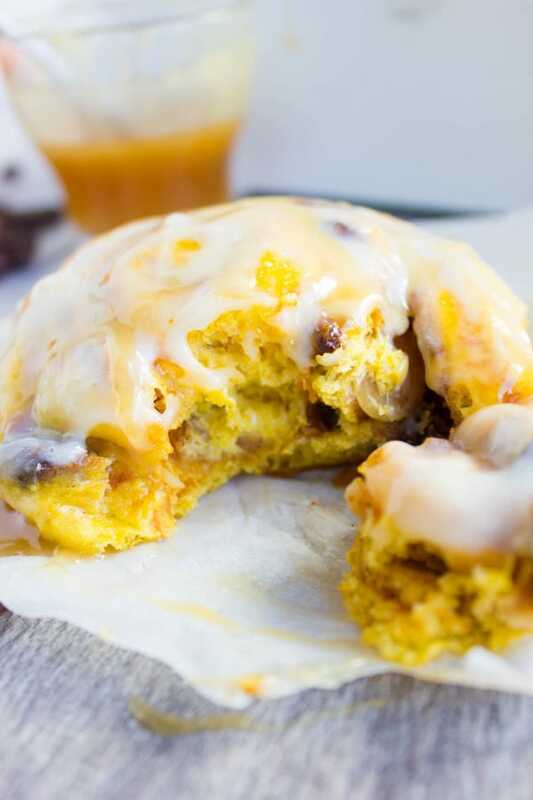 These Pumpkin Cinnamon Rolls are the perfect breakfast or brunch treat for fall and winter. The soft, tender and buttery yeasted dough compliments the cinnamon and pumpkin filling so well. A creamy vanilla cream cheese icing brings a wonderful sweetness and tanginess to these Pumpkin Cinnamon Rolls. Oh and let’s not forget the homemade caramel sauce which is just a faint drizzle- but takes the Pumpkin Cinnamon Rolls to a whole new level of caramel sweetness. And now the pumpkin filling. Oh, the pumpkin filling. 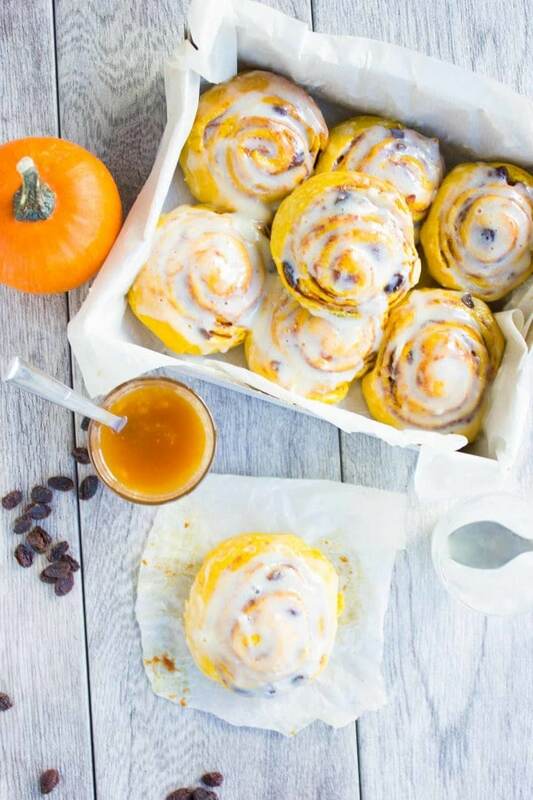 It just makes these Pumpkin Cinnamon Rolls the perfect seasonal treat. Now, I love adding raisins and slivered almonds to it, because, well, why not? And because hello—more cozy fall flavours! 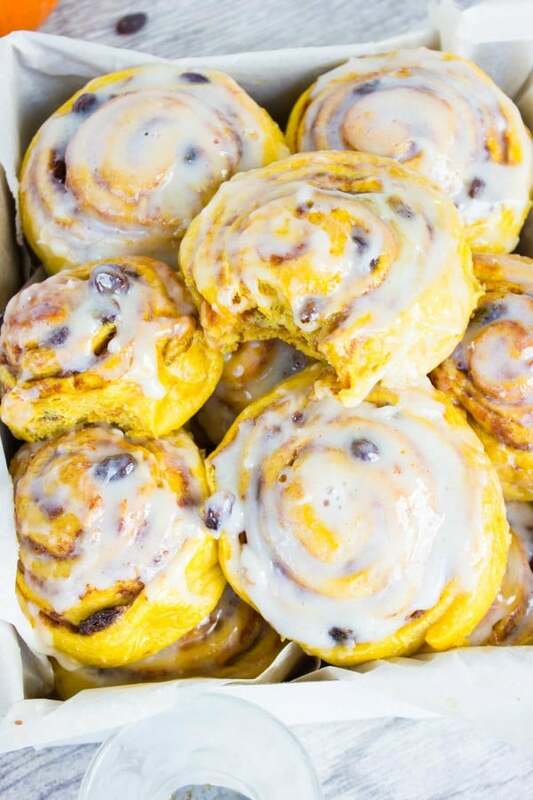 So these Pumpkin Cinnamon Rolls are the real deal. Yeast and all. But not in a scary way, I promise. Let’s take this great cinnamon rolls recipe one step at a time. Mix some flour, yeast, sugar and salt in a bowl. Add cold butter cubes and rub them into the dry mix by hand or using a mixer until the flour mixture looks wet (no restrictions like making pie dough here). After that some nice warm milk and one egg gets poured in and mixed. And just like that, you made the dough! 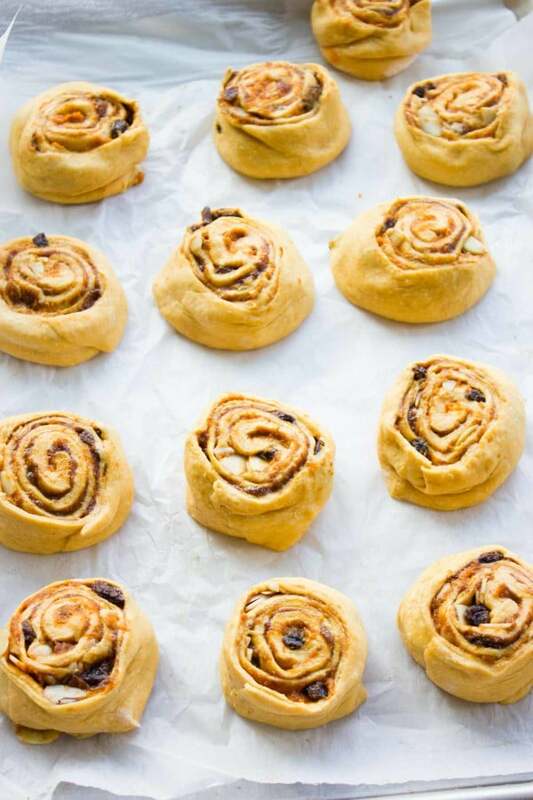 Now, kneading this dough by hand or mixer will produce optimal pumpkin cinnamon rolls, but if you’re not a kneading person, you can skip this step and simply pat the dough a few times until it holds a nice ball shape. Add in more flour if it feels too sticky. If you go back to these best soft burger buns recipe, you’ll see they’re quite similar. The dough needs to be that slightly sticky consistency that can easily be rubbed off your finger but still sticks to it. So after the pumpkin cinnamon rolls dough is ready, you’ll need to cover it up and leave it on the counter for 2 hours (less if you’re in a warm place—like half an hour less). Then, take it out and roll it on a nice floured surface into a rectangle about 1/8th thickness. Slather the surface of the rectangle with pumpkin and sprinkle a cinnamon sugar mixture. Then go nuts and sprinkle slivered almonds (or your choice of nuts, or skip!) and raisins (optional) on top, leaving always about an inch border at the top and bottom of the rectangle. Now comes the rolling part. You’ll take the long side of the rectangle closest to you and begin rolling it over the pumpkin, nuts and raisin filling to form a cylinder. The sweet tip for these beauties to hold their shape is to take a little bit of beaten egg (or egg white) and brush the long side of the rectangle furthest away from you as you start rolling. This seals in the cylinder and keeps it intact. Now take a sharp little knife and cut an inch piece along the length of the cylinder. 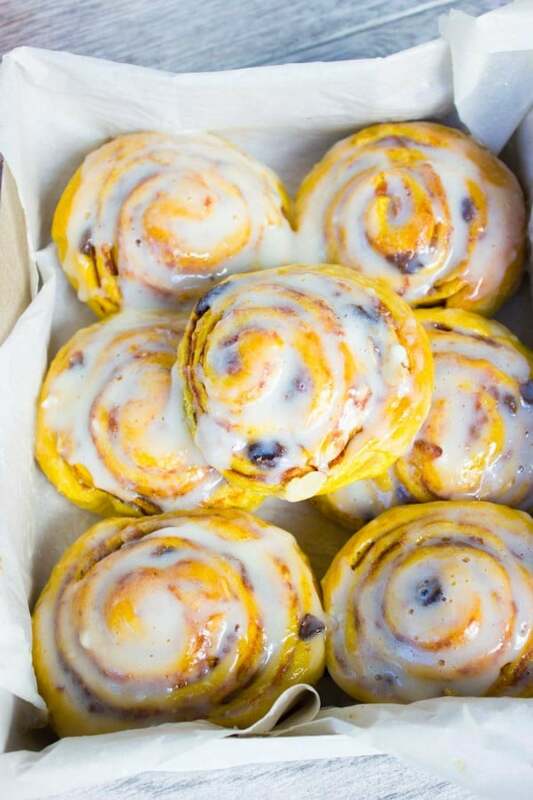 And place those pumpkin cinnamon rolls on a baking sheet for about 1 hour and a half before baking. 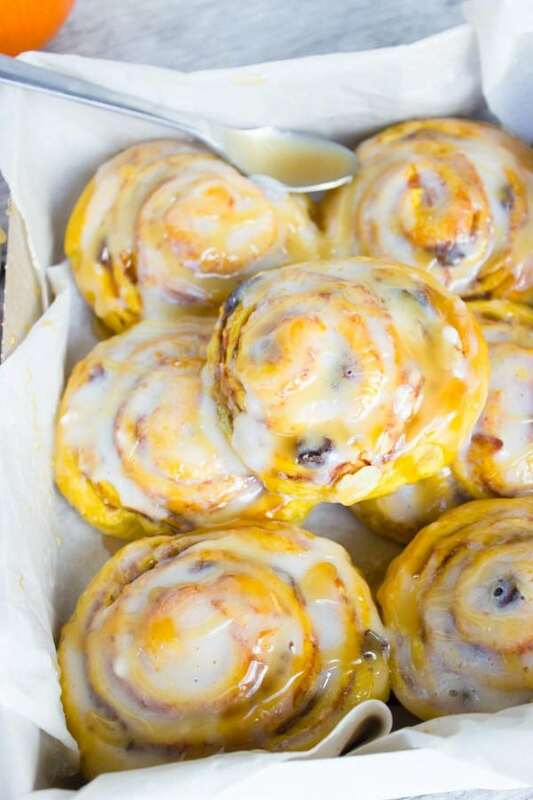 Bake the pumpkin cinnamon rolls until they are slightly golden on the edges—about 18-20 mins. Remove them from the oven and glaze them while they are still warm. 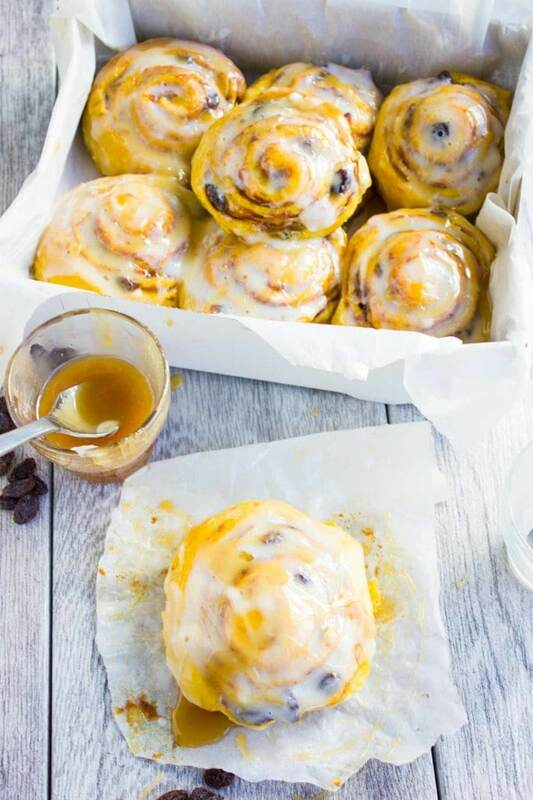 And don’t forget to drizzle these Pumpkin Cinnamon Rolls with a generous amount if Caramel Sauce! Now, go ahead and help yourself to at least one of these homemade Pumpkin Cinnamon Rolls, before they get cold! These Pumpkin Cinnamon Rolls stay soft and pillowy for days, so don’t feel rushed to eat them all in one day! But then again, it’s tough because these are THE BEST! You can double the cinnamon sugar mixture and skip the pumpkin to make those classic cinnamon rolls. Skip the raisins, and add any type of nut you prefer, cranberries, chocolate chips, espresso powder. For more Cinnamon Roll love, try my cinnamon rolls muffins. They are my go-to muffins when I’m rushed and need that cinnamon roll! 2 tablespoons beaten egg or egg white for brushing the dough edges. In a large bowl or a stand mixer bowl, add the flour, sugar, salt, yeast and mix well. Add in the butter and mix it using the mixer or rub it with your fingers into the flour mixture until the flour mixture feels wet. Add in the egg, continue mixing, add in the milk and canned pumpkin and mix until your form a dough. If the dough feels too sticky, add in a little bit of flour. Knead the dough for about 3 minutes until it feels smooth. It should stick slightly to your fingers, but should easily be rubbed off. Place the dough in an oiled bowl and cover it for 2 hours until the dough is doubled in size at least. Lightly flour a surface and roll the dough into a large rectangle about 1/8th of an inch thick, and make sure the long sides of the rectangle are parallel to you, with the shorter sides to your sides. Spread the pumpkin over the entire surface of the rectangle leaving an inch border at the longest sides of the rectangle only. In a small bowl, mix the sugar and cinnamon and then sprinkle that over the pumpkin. Then top with raisins, and almonds or any toppings you prefer. Brush the long side of the rectangle which is the furthest away from you with the beaten egg. Take the long side of the rectangle closest to you and start rolling the dough over the toppings like to form a cylinder. Use a sharp knife, cut about 1 inch pieces (bigger or smaller to your taste) along the length of the cylinder. Place the rolls with the cut sides facing up or down on the baking sheet (so the filling is exposed) and space the rolls about an inch apart. Cover the rolls with plastic wrap and allow them to rise again for an hour.